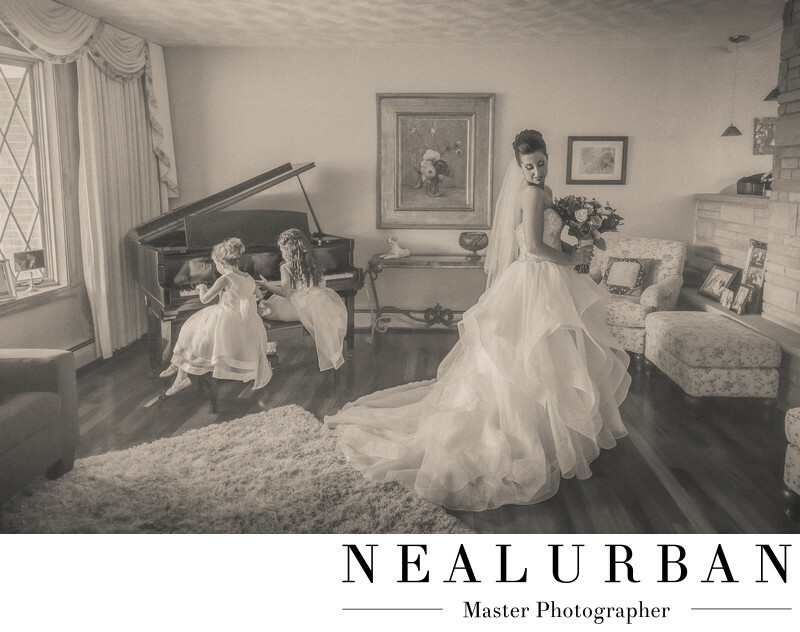 We love this image of Erica and her flower girls! She got ready at the grooms parents house. They had a super big home with a lot of room for the bridesmaids! We really liked this room for the bride to get into her wedding dress. We moved a little bit of furniture and we were good to go! We loved the piano in the back! Mom and her maid of honor helped her into the dress! After she was ready, we cleared everyone out for some bridal portraits. We had her posing like this, when one of the flower girls walked into the shot. She went over and sat at the piano! Then the other walked over and did the same thing. Neal and I started to laugh, as they both started playing keys! Erica was starting to tell the girls to move, but we said let them be. We wanted to see what they were going to do. We had Erica go back into this pose! The flower girls made the image even more beautiful! Neal turned this image to black and white. It showed much more detail in Erica's dress. It was gorgeous! He does not just click a button either for black and white. He does it all manually. You can see this shade has some brown tones in it as well. It looks like an old piece of paper! I love when he edits images like this. They look amazing and timeless! Location: 2 Fountain Plz, Buffalo, NY 14202.